NAJAF, Iraq - Radical Shiite cleric Muqtada al-Sadr, a fierce opponent of the United States and head of Iraq's most feared militia, came home Wednesday after nearly four years in self-imposed exile in Iran, welcomed by hundreds of cheering supporters in a return that solidifies the rise of his movement. Al-Sadr's presence in Iraq ensures he will be a powerful voice in Iraqi politics as U.S. forces leave the country. He left Iraq in 2007 somewhat as a renegade, a firebrand populist whose militiamen battled American troops and Iraqi forces. He returns a more legitimized figure, leading an organized political movement that is a vital partner in the new government of Prime Minister Nouri al-Maliki. Al-Sadr can wield a bully pulpit to put strong pressure on al-Maliki - and is likely to demand that no American troops remain beyond their scheduled final withdrawal date at the end of this year. His return caused trepidation among many Iraqis, particularly Sunnis who remember vividly the sectarian killings carried out by his militia, the Mahdi Army, and believe he is a tool of Iran. But his supporters were jubilant. "He is our hero. We sacrificed for him. He said 'No' to the Americans and fought the Americans, and he is brave," said Mohammed Ali, among the crowds who turned out to greet al-Sadr in the Shiite holy city of Najaf, south of Baghdad. Al-Sadr visited the holy shrine of Imam Ali, revered among the country's Shiite majority, wearing a black turban distinguishing him as one of the descendants of Islam's Prophet Muhammad, and surrounded by a phalanx of bodyguards who attempted to hold back a throng of supporters. He also visited the grave of his father, who was assassinated during Saddam Hussein's rule, before heading to his house. Dozens of black-clad Mahdi Army members spread out through the neighborhood surrounding his home. The fiery preacher has legions of followers among Iraq's poorer classes who see him as a champion of their rights against both the Sunnis who dominated Iraq under Saddam and other Shiite political parties such as al-Maliki's Dawa party, which represents more of the Shiite middle class. Al-Sadr has not been seen publicly in Iraq since 2007 when he left to study Islam in Qom, the seat of Shiite education, as a way to burnish his religious credentials. He also faced an arrest warrant for his alleged role in assassinating a rival Shiite cleric. The arrest warrant appeared to be in effect as recently as last March but the chances it would be enforced appear highly unlikely considering the alliance between al-Maliki and al-Sadr. The public nature of al-Sadr's return - his first appearance in Iraq since leaving for Iran - suggested he had little to fear. The cleric and his followers have parlayed their street credentials earned from battling U.S. forces and a savvy political organizing ability into 40 seats in the 325-member parliament during last March's election. Their grudging support for al-Maliki secured him a second term. "The American occupation was always a useful rallying point but his objective is power in Iraq," said Joost Hiltermann from the International Crisis Group. For many Iraqis, especially the minority Sunnis, al-Sadr and his Mahdi Army will always be synonymous with the vicious sectarian killings that they are blamed for carrying out during the worst of the sectarian violence in 2006 and 2007. In the Azamiyah neighborhood that used to be a favorite target of the Mahdi Army death squads, residents watched his return with concern. Ahmed al-Azami, a 43-year-old lawyer, said people fear his militia will once again become active and described al-Sadr as little more than a tool of Iran. Al-Sadr's return came on the same day that the Iranian foreign minister made his first visit to Iraq. During a visit to Najaf, the Iranian ambassador, Hassan Danaie, praised al-Sadr. "His presence will serve stability in Iraq," the ambassador said. An official from the Sadrist office in Najaf said al-Sadr's return was permanent. He spoke on condition of anonymity because he was not authorized to speak to the media, and al-Sadr made no public comments. 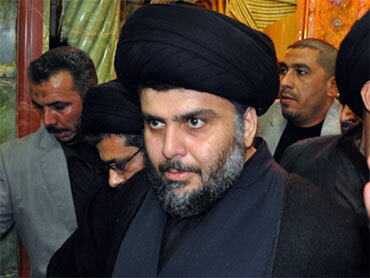 Enmity between al-Sadr and al-Maliki runs deep. Al-Maliki in 2008 launched an offensive against al-Sadr's followers in Baghdad and the southern city of Basra. The show of force infuriated many of his Shiite allies but also demonstrated al-Maliki's willingness to go after all militias, even those representing his own sect. But al-Sadr eventually backed al-Maliki for a second term after protracted negotiations following the March elections, likely owing to intense pressure from Iran and in return for concessions. Iraqi officials have said that hundreds of his followers have been released from jail, a key Sadrist demand. Iraqis in many southern provinces and parts of eastern Baghdad where the Sadrists dominate have reported intimidation by Sadrist members, who are feeling bolder in light of their newfound political power. They have tried to enforce their strict Islamic restrictions in areas they traditionally controlled, cracking down on the sale of alcohol or cafes where people smoke water pipes. Iraqi political analyst Hadi Jalo told The Associated Press that al-Sadr's return underscores the U.S.'s waning political influence in Iraq as U.S. troops prepare to leave the country entirely by the end of this year. "Now, the anti-U.S. political figures, whether Shiite or Sunnis, are feeling that they are more confident now and their role in shaping Iraq's future is expanding. The Iraqi government is ready more than ever to accept and include figures known for their anti-U.S. stances," he said. "The Sadrists now are politically stronger than ever and they are aware of their importance in Iraq's political life."